Hey babes! I don’t know about y’all, but I always end up waiting until the last minute when it comes to finding the men in my life Christmas gifts. 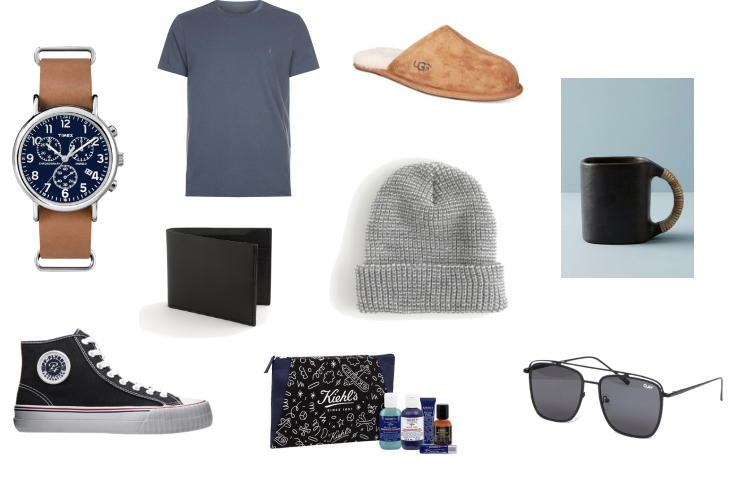 I tried keeping my men’s holiday gift guide under $100 a little more simple for y’all. I chose items that I know Michael loves and some are items he already owns. Timex is a classic watch brand and I am so happy they are coming out with trendier styles without the high price tag. Michael won’t wear metal watches because the link pull his hair, so I always go for leather or some other type of material. Ok, you might be wondering why I put a basic t-shirt on my list, but I decided to add it because every couple of weeks Michael orders a couple of these t-shirts. If you have ever felt an American Apparel t-shirt then you will understand why he keeps buying them. SO SOFT! Plus you can get two for under $25, so a great buy as well! Everyone needs a great pair of slippers and these Ugg slippers looked super cozy. A wallet is essential and just something that I try to buy at least once a year. I know some men don’t even use a wallet. My dad has never had a wallet or money clip. He would rather a good old fashioned rubber band! Ha! In my opinion no one can have too many beanies. This one from JCrew is super soft and perfect for any guy in your life. I know these look like Converse, but they are actually PF Flyers. Michael won’t wear converse anymore. Ever since I got him his first pair of PF Flyers he can not believe difference in comfort between the two brands. I bought him his first pair about 5 years ago and since then has bought himself at least 2 pairs a year. All different colors and I am pretty sure I will be getting him another pair for Christmas. Men like to be pampered too! I love this Kiehls mens set because it comes with a little bit of everything. Michael really like the facial wash and I’m pretty sure he loves the lip balm as well, but would never admit it. Lastly I picked out these Quay Mr black sunglasses. I love Ray-bans, but Michael has shattered so many pairs. I finally realized it wasn’t smart to spend that kind of money on his sunglasses. So far so good with these Quay‘s. Michael has been wearing them for about 6 months and not one scratch….yet! Hope y’all are having an amazing week so far! Check out my Women’s Holiday Gift Guide under $100 too!